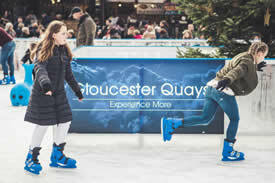 An astonishing success, in 2016 Gloucester’s first real ice, open-air rink sent visitor numbers soaring at the already popular outlet shopping centre and leisure quarter, Gloucester Quays. Visitor numbers were up 13% over the Christmas and New Year period compared to the year previous with a huge increase on sales of 19%. Over 36,000 skaters headed to the ice to enjoy the 300sqm rink. 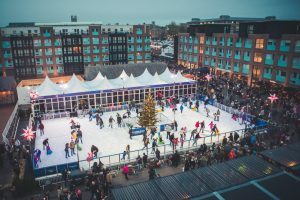 Through careful consultation with the client at the Quays, Christmas Ice Rinks delivered the project, from planning permission and build period through to live dates – staffing and operating a box office, ticketing system, skate exchange, ice servicing and maintenance.